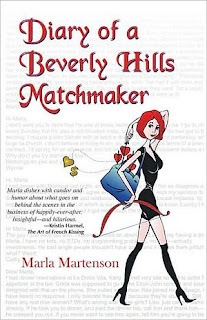 I am reading Diary of a Beverly Hills Matchmaker by Marla Martenson, which I got from the author. This book is really funny and fun so far. "'A chichi decorator came up with the color of one of the walls in my Beverly Hills office by matching paint swatches to the silky dark chocolate Godiva heart-shaped ganaches that sit in a crystal dish alongside Teuscher Irish Cream truffles, and chocolate cordials of cherries soaked in black port and wrapped in gold foil." The first page then launches into an email from a semi-satisfied male customer from the match-making service that is really funny. This memoir proves to entertain me for the weekend. Oh, this does look like a fun read...the idea of matching the wall color to candy is delectable! Sounds interesting. Love the book cover. Have a great day! Sounds like a fun read! I agree about Room, my grandma won't read it because it sounds too depressing, but I told her that it isn't because of Jack. If it was from Ma's perspective it would definately be way too scary! What an opener! Certainly throws you right in and gives you a sense of the story's flavor! 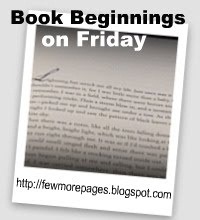 :) Thanks for participating in Book Beginnings! To answer your question about the color block @ my post, I use the highlight button and sometimes it comes out like that. I like it when it does that, but I'm not sure why it only works that way sometimes. Maybe with the picture placed on the left it makes it into a block?